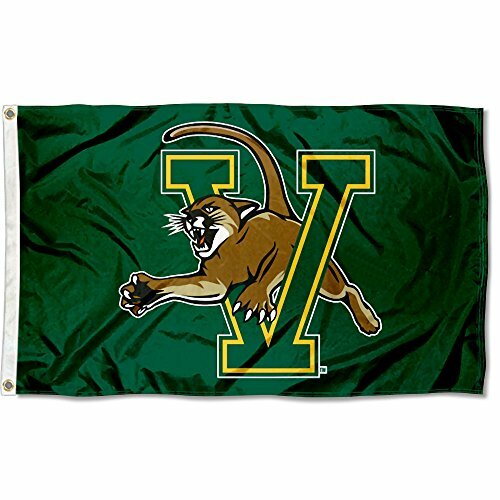 This Vermont Catamounts Green Flag measures 3' x 5' in size, has Quadruple Stitched fly ends, is made of 150D Polyester, and has two Metal Grommets for attaching to your flagpole. The Screen Printed Vermont Catamounts logos are Officially Licensed by Sewing Concepts, Inc. and Approved by University of Vermont. The team logos, words, and insignia are Viewable from Both Sides (Opposite Side is a Reverse Image). This 3x5 Flag is a perfect flag for your tailgate pole, home pole, or as a wall banner.